Learn how to use CCC Library services at the Harmony Campus. If you have questions or want assistance with your library check-out, please contact CCC Library - we are always happy to assist! Please do not contact the front desk at Harmony campus with library questions - they will refer you to the same email and phone number. 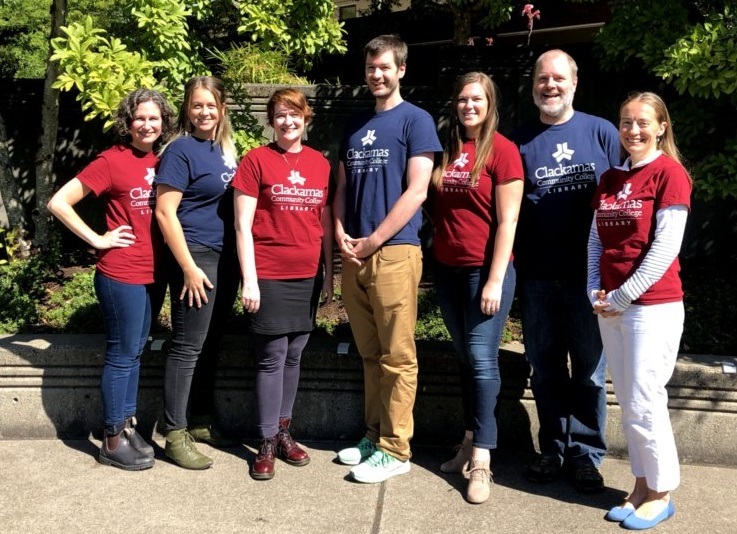 Librarians are based at the Oregon City campus, but are fully available to assist you with your library usage. If you'd like to search library databases for eBooks, articles, and other online resources, use CCC Library's online catalog! Want help with online library searching? Check out the Research Help page! 1. Go to library.clackamas.edu to access our catalog - the search bar in the center of the page. CCC + Summit searches the materials CCC Library owns in addition to our 37 partner libraries - giving you full access to collections at schools like PSU, UO, OSU, and UW! Books take 2-5 days to arrive. Learn more about Summit! 3. Enter your search terms and select Search. Need help developing keywords? We've got a guide for that! 4. You must be signed into your library account to request books and other items! If you have not signed in, do so using your student email address (including the @student.clackamas.edu) and password. Trouble signing in? 5. When you find an item you like, select its title to open a detailed view. 6. Use the Pickup Location drop-down to select which campus you want your item sent to. You will receive an email when the item is available for you to pick up at your selected destination. The only pickup location for Harmony Campus is the Harmony East front desk. Bring your student ID with you when you pick up your item. You will receive an information slip with your item that tells you your due date and where to get help if you need it! You will receive an email when the item is available for you to pick up at your selected destination. The only pickup location for Harmony Campus is the Harmony East front desk. Bring your student ID with you when you pick up your item. You will receive an information slip with your book that tells you your due date and where to get help if you need it! Library books and Summit items may be returned to the Harmony East Front Desk (the same place you checked them out) during open hours. Unfortunately, CCC Library will not have a book drop for 24-hour return until Fall 2019. 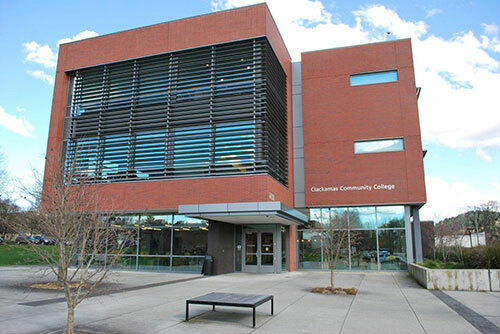 CCC Library has two book drop locations on the Oregon City campus. Inside the Dye Learning Center, immediately inside the second set of doors. Outside on the north side of the Dye Learning Center, next to the US mail box. Use this book drop to return material after-hours. 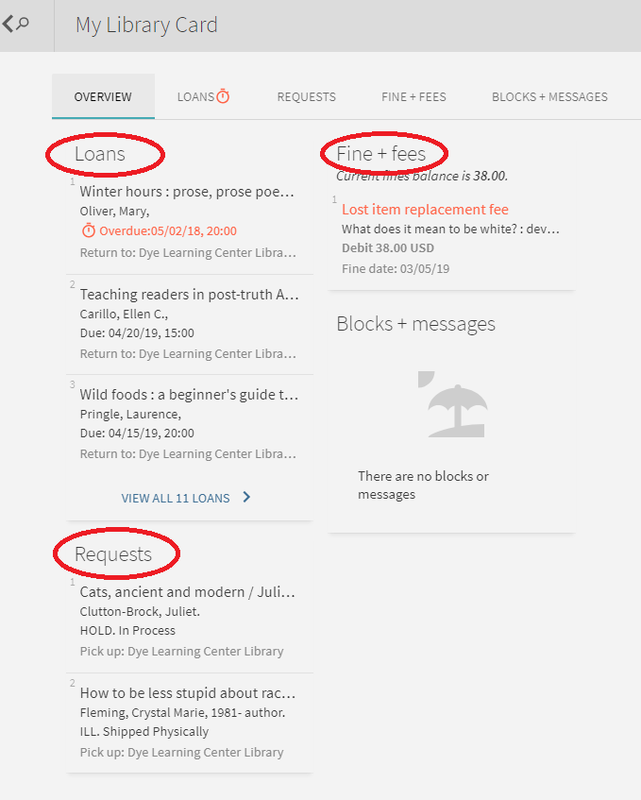 Logging into your library account enables you to see what library items you currently have checked out, as well as holds you have placed and are awaiting. Either way, you need your full student email address (with the @student.clackamas.edu) and password to log in. Having login troubles? This is where you can view all your loans, requests, fines, or blocks.